A view of Cold Mountain, the highest peak in the Shining Rock Wilderness area of Pisgah National Forest in the American state of North Carolina. The real Cold Mountain is not a town. It is the highest peak in the Shining Rock Wilderness section of Pisgah National Forest, North Carolina. At 6,030 feet it is an awesome sight - especially in the fall - as one travels along the Blue Ridge Parkway southwest of Asheville. To really appreciate the mountain's grandeur, and that of the general area, one must do what Inman did - hike it. Flowers, like gorgeous rhododendron, bloom in season now - replacements for old-growth trees which have been cut down. 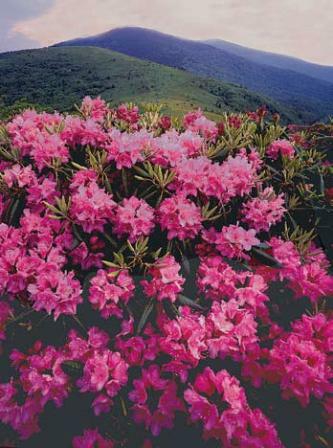 This image, from the U.S. Forest Service, depicts the natural gardens of Catawba rhododenrons growing near a high ridge known as Roan Mountain. The State of North Carolina has a live web cam which allows interested people to view the mountain before nightfall. Sometimes it is shrouded in fog; other times it sparkles like an Appalachian gem. As featured in the movie version of Cold Mountain, people who lived in the area during Civil War times sang hymns in the Shape-Note tradition. First published in "The Sacred Harp" hymnal, in 1844, these four-part songs feature unusual sounds and harmony. The notes themselves are written in different shapes instead of circles. Today, often while sitting in a kind of hollow square, men and women still harmonize their voices - without instruments - in the old style. It is most common in America's Southeast, although there are clubs throughout the country, including at universities. 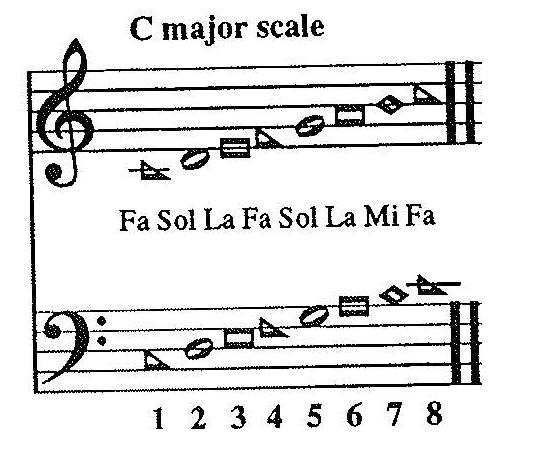 What does Shape-Note singing sound like? Where did it begin? A Georgian named B.F. White originally compiled the hymnal which, in an updated version, is still used today. Examples of Shape-Note singing are available online, including the Sacred Harp Singers at Liberty Church who are featured on the Cold Mountain soundtrack. Today, Cold Mountain doesn't look exactly like it did during the Civil War. Because modern life has caught up with both the mountain, and the surrounding area, the movie was filmed in the Carpathian Mountains of Romania. But, then again, who really knows...maybe off the beaten path, somewhere, one might still encounter a Goat Woman who can once again help a wandering hiker find the way home. Bos, Carole "THE REAL COLD MOUNTAIN" AwesomeStories.com. Dec 01, 2003. Apr 20, 2019.